http://www.mha.nic.in is the official website of Intelligence Bureau (IB) Junior Officer Recruitment 2016 Online Application Form, Download Admit Card, Exam Date, Interview Call Letter, Result etc. Qualification: Plus Two (+2) with Physics, Mathematics and 2 Years ITI Course in Radio Technician or Electronics or Electronics and Communication from a Recognized Institute. 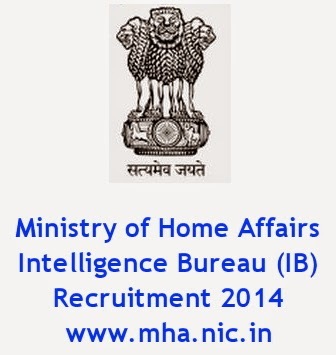 How to Apply for Junior Officer in Intelligence Bureau (IB)? Visit the website http://www.mha.nic.in and click on the Post Applying For and Click Proceed. Read the Advertisement carefully and tick the desired box and Click on Apply. Fill the Online Application Form and Upload the Photo and Signature and Make the Payment of Examination Fees and Click and Preview the Application Form. If there is no mistakes then click on Submit and a Registration Slip will be generated, take a printout of it. Admit Card and Interview Call letter will be mailed to the E-Mail Address provided and it will be notified through SMS if you gave a Mobile Number. Admit Card can be also downloaded from the Website. See the website frequently.